Lots of water during the growing season will make lots of stem with huge leaves. 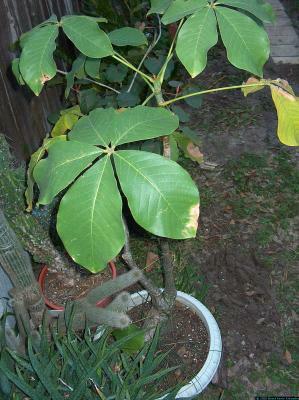 Sparse watering makes it lose leaves, but it is healthy otherwise. It is easily propagated by stem cuttings. It likes sun with protection from the hot midday sun when it's in a container, but when it's planted in the ground it seems to take all the sun you can give it. The roots are massive but very easily broken when digging it up, but the plant doesn't seem to care; it's very hardy. This particular plant was harvested from a farm in Mexico. I've seen imported plants come in that are almost covered with moss, so my guess is that they would be fine in a shady area, although when I've put potted Bombax in shady areas they don't grow very fast and are somewhat leggy. I've never tried leaving this one in the cold during winter.